One of the biggest challenges for anyone engaged in social media-related activity is simply getting everyone on the same page. More often than not, if an ad agency talks to you about social media they're really talking about social media marketing (or specifically doing either a YouTube or "viral" video if they are inclined towards TVC or film work, or a cool Facebook app if they're more tech savvy). If you speak to someone working in PR or corporate communications they refer to using Twitter, Blogs and Facebook to get our a corporate (and generally one-way) message - Social PR. But there's also distinct and important disciplines with the overall social media or social business category like Social CRM and Social Commerce that need to be approached quite differently. 1. Social media marketing - using social platforms (in particular Facebook and YouTube) to share new product launch, or campaign content. The focus is "sharing" or becoming "viral" rather than true community building or customer engagement. This is most often seen when launching new products, or when doing a campaign with a limited life span to a specific customer segment. 2. Social CRM - is the ongoing use of analytics around the Fans, Followers, Likes, Connections, etc. to predict and influence purchase behaviour. This is more often seen in B2B marketing, or when targeting "influencers". It's an underutilised and misundertood area right now, but will be where marketers spend a lot of time and effort in the near future. For example, I know that it costs Dell about US$1.10 to acquire a Facebook fan (in Asia) and that a Dell Fan (consumer) is worth on average $72 more in revenue and are 41% more likely to recommend Dell to friends, family & colleagues (according to the "Value of a Facebook Fan" research by Syncapse - available here). This is marketing gold and the basis of how you crack the social media marketing ROI code. 3. Social customer service and customer engagement - Social media as a customer service tool is becoming the norm. Why sit on hold waiting for a call centre operator when you can vent your frustration with a brand instantly (and publicly)? You often get a much faster issue resolution and a dedicated, personal response - every brand wants to transform you from a detractor to a passionate brand advocate right? At Dell, I know that every day there are 25,000 conversations about the Dell brand in social media. Many of these are customer service-related. Any customer service-related issues are captured and sent to our @DellCares team (45 customer service specialists worldwide) for issues resolution. These issues are found mainly on Facebook brand pages, where customers are complaining about something, on Twitter (although the complaints are shorter, they are also more focused) and in Blogs/Forums. 4. Social commerce - Such as Groupon-like daily deals (such as what we've developed at Dell, at www.dellswarm.com ), group buying or special offers being made available on social media sites as exclusives to that Fan group or customer segment. 5. Socialising a purchase path/experience - Following the same path as eBay, where everything is fundamentally social. Buyers, sellers, products are all rated. 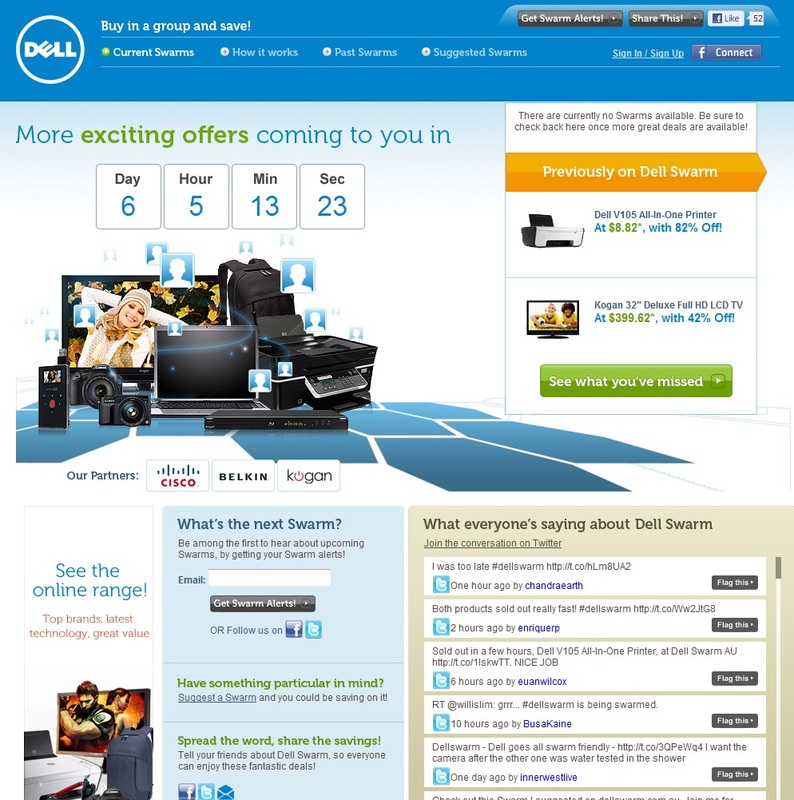 Again using Dell as an example - On Dell.com we've added a 5 star user generated review system, where customers rate each product. In the near future, everything from laptops to bananas will having UGC customer ratings and reviews. 6. Social communications/PR - Where social all started - using Blogs, Forums, and more recently Facebook, LinkedIn and Twitter to communicate a corporate communications or PR message. Most of these messages are one-way, but allow customers/the audience to comment/react to. The art and magic of this is working out which of the 6 you can actually execute at different stages of the customer engagement lifecycle. My bet is that within a few years all companies will be engaged to various degrees in each of the 6 forms of social media, but I doubt we'll be simply calling it "social media" anymore.